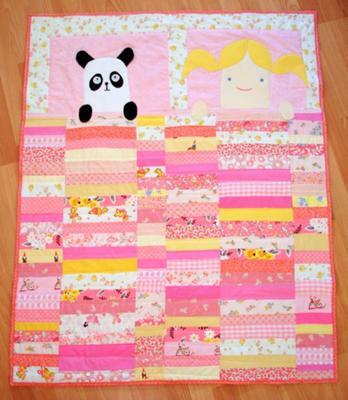 Designed to look like a little girl tucked into bed with her panda bear, the quilt uses a combination of applique and traditional piecing. The design is my own. This quilt was made with a combination of contemporary fabrics (including some Japanese imports as well as some prints from Denyse Schmidt and Heather Ross) and vintage fabrics. The color scheme of yellow and pink was to coordinate with the backing fabric - a large scale linen print with pink dots and yellow chicks. You can see more of my quilts on my blog (http://blempgorf.blogspot.com). I would love to get this pattern if it is for sale. My daughter LOVES pandas. jill dot daniels at gmail dot com. Adorable! just like ancient west african applique! I love this pattern...my daughter is expecting twins and I would love to make this quilt for them and my other two grandchildren...would it be possible to get the pattern????? I was wondering if we are able to purchase or download the pattern. This is such a creative quilt. Love it.